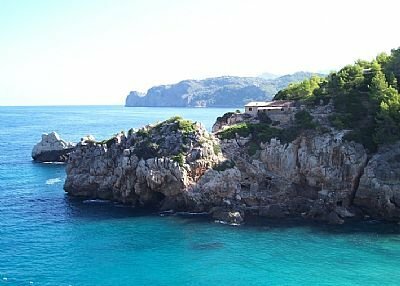 Cala Deià is situated at 10 kilometres from Sóller, between Punta de Son Beltran and sa Pedrissa, where a defence tower against the pirate attacks is located. The impressive mountains of es Teix (1064 metres high) and el Caragolí are also situated next to Deià. This beautiful sea inlet, surrounded by medium-high cliffs, with scrubland and pine wood, finishes on a semicircular beach where a torrent flows into the sea and there are some fantastic terraces. The beach has coarse-grained sand and gravel and a quite steep slope. On the sides there are a small jetty, escars and some restaurants, very well known for their rice and fish-based dishes. In the summer it is normal to see internationally famous people. The marine and underwater conditions are not safe for anchoring boats because of the strong wind that blows from the northwest-north-northeast it is a dangerous area. next to the beach there is a rock under the water at a depth of three metres and the sandy and rocky ground is insecure. If you want to anchor you are recommended to do it by daylight and in front of the jetty, on a ground of sand and gravel, with a depth of four metres. At 3,7 nautical miles there is Port de Sóller. The accessibility by car is easy following the signs. In the surroundings there is a parking area which is always crowded. You are recommended to walk down the last kilometre on the road or on the stony tracks dels Ribassos and de sa Vinyeta. Not far from the idyllic mallorquin village of Deià we find this small cove. Some 200 metres from the beach there is a car park from which one has to walk the rest of the way. With a length of 75 metres it is one of the most beautiful coves on the island. Cala Deia is a very beautiful small shingle beach with clear waters and rock pools. It's one of the few beaches on the west coast of Mallorca, but don't expect miles of golden sand - it's far more rugged here and you'll need to bring a chair or a lilo to lie on!. The sea is wonderfully clear and inviting and perfect to cool off in on a hot summer's day. The beach is served by two excellent Majorcan restaurants where you can sit and enjoy the spectacular surroundings. It's also a popular place for artists to set up their easels. You can drive down (sign-posted Cala Deia, on the outskirts of the town heading towards Soller) but pay parking is quite limited and you might be better to leave your car in the village and take the walk down the perfectly maintained path to the beach (note it is a steep hill so be prepared for the return journey!). Because of its peace and extraordinary beautiful scenery, since the XIX century, many artists, musicians and writers have chosen Deià as their residence. Amongst others, are the English author, Robert Graves (1895-1985) and the artist and archaeologist from USA, William Waldren (1924-2003), founder of the Archaeological Museum of Deià. Deià also has a varied selection of bars and restaurants, mostly in the middle of the town on either side of the road between Valldemossa and Sóller. In the summer, the terrace of the Café Sa Fonda frequently has musical performances.